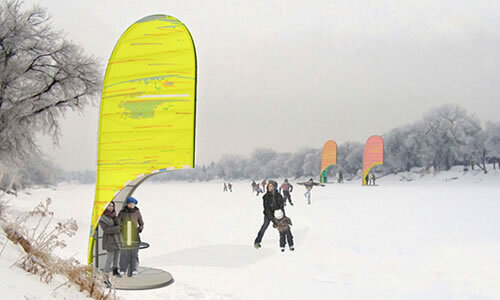 Skating on the frozen surface of the Assiniboine River, a popular winter pastime, will work up quite a chill. 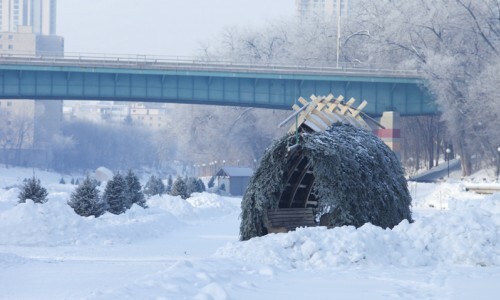 Recognizing this, makeshift warming huts have long been used along the river to provide a temporary respite from the cold. 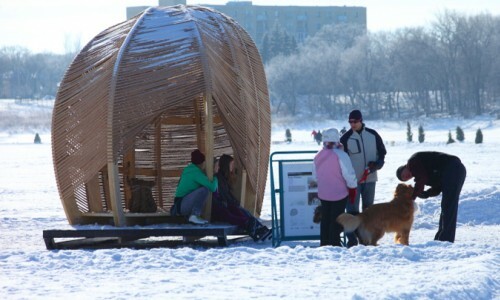 Several years ago (2010), a local art-and-architecture competition was started in Winnipeg to see how the simple warming hut might be creatively rethought. The result has been an annual showcase of fun and function that does Winnipeg proud, as these images attest! 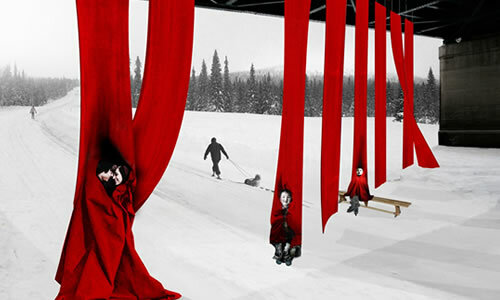 More about the warming huts can be found at the site for the annual competition. Stunning photos. Kind of scary that these are required. Yes — the north wind doth blow! The wood pile hut looks most inviting of them all, and the Ha(y)ven hut looks the most scary. That wood fire amidst the snow and ice is inviting and you can almost feel the warmth. Lots of good photo ops as well! Supposed to be great for skating! I agree with Weggieboy. 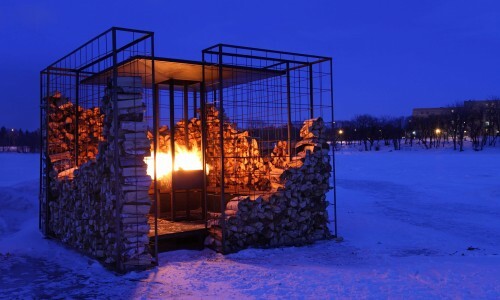 The Wood Pile Hut is my favorite, and I would not be lighting a fire in the Ha(y)ven. 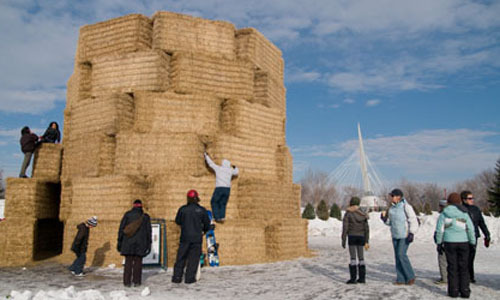 A geography professor of mine from Winnipeg liked to talk about the creativity of the architecture and design students at the University of Manitoba and said they were very ingenuitive when it came to eco-friendly structures. Your photos capture that same practicality and style: fight the cold, but still look attractive and unique. You must have near frozen while stopping to take so many photos! I’ve never been to Winnipeg, but one day I’ll visit the city instead of flying over it as most Canadians do on their way from the West to East or vice versa. Thanks for sharing these stunning photos! I think extreme conditions (such as biting cold, of which Manitobans certainly have their share) bring out some of the best in people. Thanks for the comments on the photos, but, unlike many of the photos I post, those aren’t mine so I can’t take credit. I believe they were taken by the folks running the competition or are user submissions. I agree with Elaine. We left Winterpeg in 1966. This doesn’t look credible! Now, where are my skates, and I’d better book a flight to that exciting place. The old neighborhood has changed, as they say! Kurt, thanks for sharing those terrific memories! So intense and alive! I love these pics, Brett — it looks like a fun competition !!!!! Delightful post. The burst of color and life in these photographs is just lovely. The Hygge Hut catches my eye the most out of all these. Thanks! Thanks. The modern feel of the Hygge Hut appeals to me. How “cool” is this! Thanks for dropping by my blog, Brett, and dropping a few ‘Likes.’ Much appreciated. I love what you’re doing here, because I love Canada too! Wonderful, Winnipeg was my first city, love it and love the people. How perfect is this?! 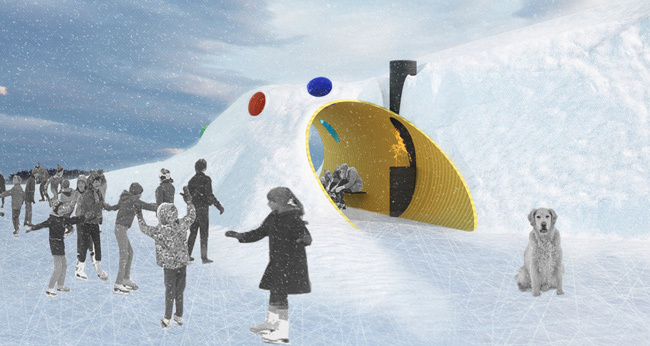 I love the ways Canadians embrace winter, especially with skating, and this combination of winter, fun, and creativity is too excellent! Great observation and very much agree! That’s all amazing and a tiny bit mad, isn’t it? Gotta love that kind of madness! Thanks (although those photos aren’t ones I took). Thanks for this and interesting. I live in Calgary, Alberta and our winter temperatures do plunge down as low as Winnipeg’s at times — -30 to -40 degrees C. Just perfect shelters for dangerous cold!! That’s frigid! In that level of cold, I’d stay indoors and away from the shelters as well. 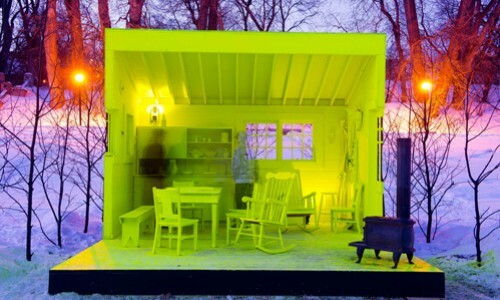 These warming huts are fascinating. 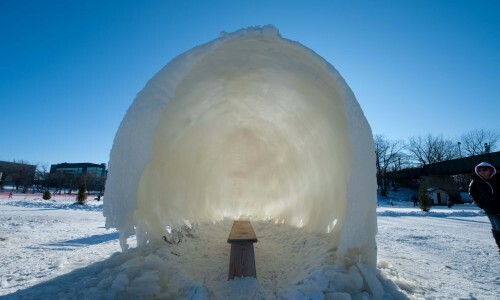 Living in Illinois in the US we don’t see the kind of cold that is experienced in Winnipeg but it’s nice to know that these huts are around should anyone need them. Eric, the one with the fire pit appeals most because of the weather. I have to agree. The fire pit is my favorite with the Ha(y)ven Hut coming in at second(reminds me of a larger version of the forts we built when I was a kid). This is so cool! Pun intended. 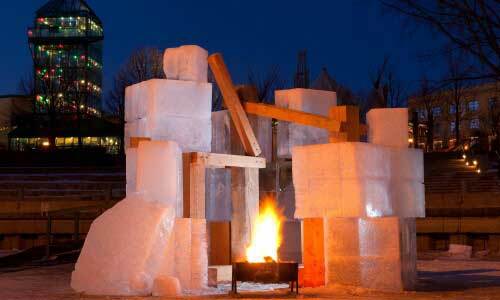 As a southerner, it amazes me that they can build fires on ice. Thanks for sharing and dropping by my blog. 🙂 Yes! I always wonder about how thick such ice must be.